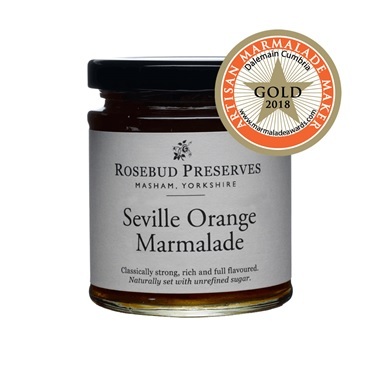 Award-winning Rosebud Preserves is celebrating after being awarded a Gold for its Seville Orange Marmalade at the 13th World Original Marmalade Awards. The Masham based firm are the only Yorkshire based fine food producer to have been awarded a Gold at the awards that were held at Dalemain House in Cumbria. “The fruit to make our delicious marmalade comes from a grower based in the heart of Andalucía, Southern Spain. Their orchard has been supplying Seville oranges to us for over 20 years, as the quality of the fruit is excellent. The same family has been running the farm for over three generations. The Artisan judges for 2018 were a prestigious panel of food industry experts, including Fortnum & Mason head buyer Brigette Hardy, Telegraph Food writer Xanthe Clay and longstanding Awards patron Dan Lepard, food writer and baking guru. The results of this year’s awards in Cumbria proved that far from going out of fashion, quality marmalade is loved not only in Britain but around the world, where it is fast becoming an international obsession, with entries received from as far afield as Australia, Canada, Japan and Malta. Jane Hasell-McCosh, founder of the Awards, said: “I think this is a very exciting time to be making preserves, as we are seeing how people’s love for marmalade and creativity have led to a true embracing of the versatility of the preserve, with all sorts of interesting flavours and ingredients being incorporated. The quality of marmalades this year was at an all time high, with our artisans creating truly exquisite products. Rosebud Preserves has been making its jams, marmalades, chutneys and jellies from their North Yorkshire base since 1989 when Elspeth started the company using local produce to make traditional recipes.